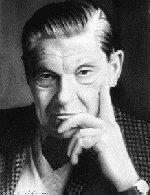 Arthur Koestler CBE (September 5, 1905, Budapest - March 3, 1983, London) was a Jewish-Hungarian polymath author who became a naturalized British subject. In 1931, he joined the Communist Party, but left the party seven years later, after emigrating to the United Kingdom. By the late 1940s, he was one of the most recognized and outspoken British anti-communists. He wrote numerous books, of which the most famous is the novel Darkness at Noon about the Great Purge in the Soviet Union, an indictment of Stalinism.